My partner, Thom, got in on the ballet word association as well. His words for Oh, Inverted World : quirky, sweaty, emo sport. 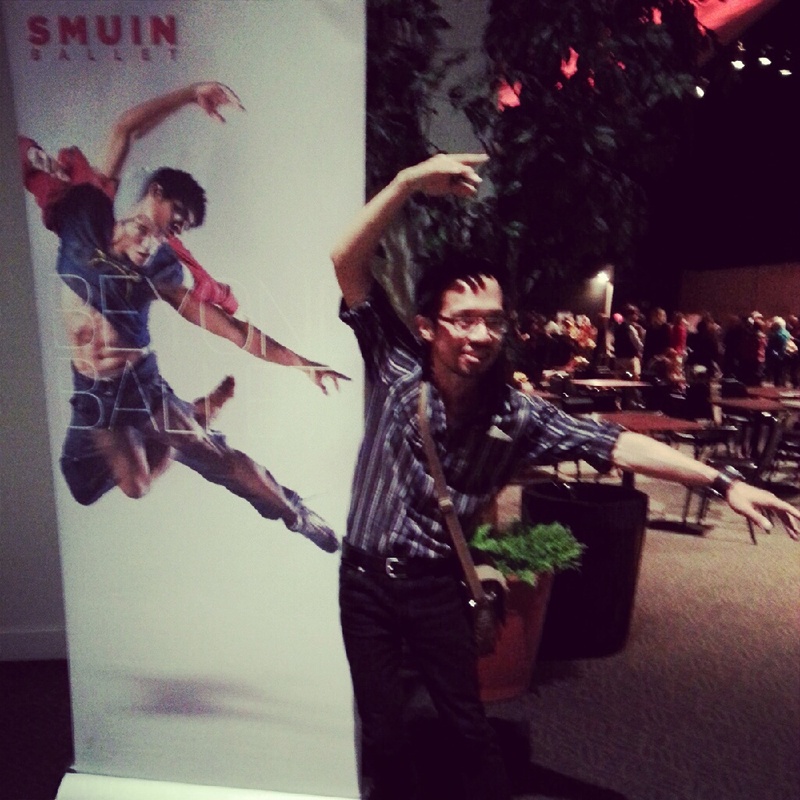 Poster posing at Smuin Ballet. So sorry I’m missing this, sounds like a great program! But I could have lived without the tube socks and athletic shorts – I know the aesthetic kind of goes with the music, but couldn’t the costume designer have come up with something equally fun and more attractive? In fact, while I’m griping… why do so many people choose to dance in shorts? It cuts the line of the leg and unless you have perfectly sized and toned thighs just highlights any imperfection…Hey, Jeff, how about a post on bad fashion choices in ballet? – I’d love to hear what a ballet geek has to say about that! Oh! I love the SMUIN Ballet! My grandparents have been taking my cousins and me to the Christmas Ballet at the Yerba Buena Center every year since I was about 10. I’m seeing it again this year, but for the first time at the Livermore Bankhead Theater. Have you seen their Christmas Ballet? It’s not Christmas without it! So happy to hear all the wonderful comments on Smuin Ballet! We are really excited for the 2012 edition of the Christmas Ballet!! Here’s a sizzle clip of the Christmas Ballet to hold you over until we open in Livermore on Nov. 23. Next PostNext Happy New Year 2013! I’m Jeff! Join me as I share dance news and reviews around the San Francisco Bay Area and my assorted thoughts on learning ballet as an adult.